And so the Launch Day (L-0) day begins. I have skipped coming to the Cape on L-1, Thursday, July 7, 2011, because of the rain and because what we wanted to see — the press conferences — were on NASA-TV. We could sit in our kitchen, eat with feet propped. Another reason to skip L-1 was because I had been over to the Cape for three straight days — and this was coming off of two days in Houston at Johnson Space Center last week. 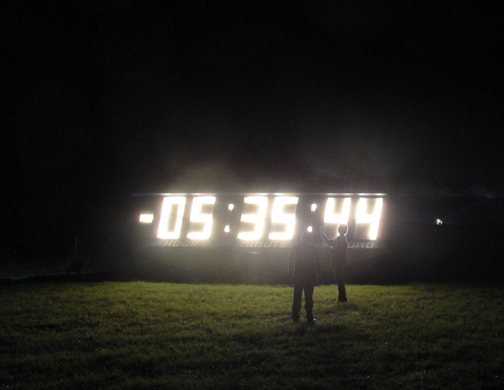 Two Canadian journalists walk in front of the countdown clock about 2:30 am, Friday, July 8, 2011. Like many journalists they paid their way, and drove more than a day to get to the Cape. If the shuttle failed to launch on Friday, they might be able to stay Saturday, but by Sunday they would have to begin their long trek home. The space program is a beacon to young journalists like these kids, and to youth in general. 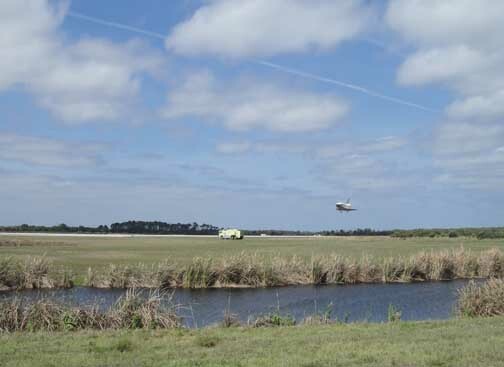 The tiny dot on the far right is Pad 39A and the Shuttle Atlantis.. I was tired. Carol Anne was exhausted, and even skipped L-2 (Wednesday). By skipping L-1 we did miss the restraction of the Rotating Service Structure, but early in the afternoon we got a call from a friend at the Cape asking us if we planned to miss the driving rain and mud out at Pad 39-A. Unn, the answer was Yes. I noticed, in going through my notes for the recent launches, that I had also skipped L-1 during the STS-134 launch in May. Must have been tired for that one, too. 11 pm, July 7, 2011 — To the Cape. Carol Anne and I had decided to coast over to the Cape starting at 11 pm. That should put us inside the security bubble by 12:15 am if traffic was minimal as we expected it would be. 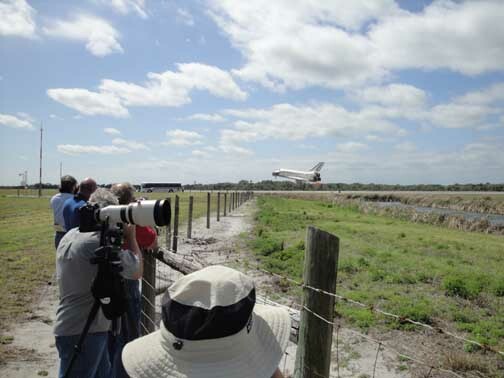 The unknown factor was how many people would be streaming over hoping to find spots to view the launch outside of KSC. We were betting that in the rain the 1-million expected people would be in no hurry — and we were right. Traffic on the Beachline, Highway 528, was moving at its accustomed 75-80 miles an hour, complete with the usual tailgaters. The JSC press crew doesn't always love the Tweeters like I do. 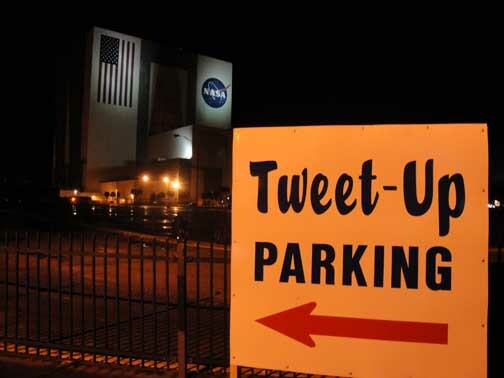 For the second attempt to launch on STS-134 the Tweet tent vanished. This time Tweeters autos have been banished to a far away parking lot. No matter -- the Tweeters are also enthusiastic and are one-timers (they do not get to come back a second time). There are only 150 of them and I'm looking for them. It's 3 o'clock in the morning and none are anywhere to be seen. Do you know where your Tweeter is? I don't. Inside the security bubble, 12:15 am, Friday, July 8, 2011. We wanted to be at the media site by the time the decision was made on tanking. This was the crucial decision — unless they tanked, the mission was scrubbed, but I was sure they would tank and, right on, at 2:01 am they began tanking. The Tweeters had been banned from the media parking lot and must trudge better part of a half mile to their tent. Good for us, and great for finding a parking spot in the media parking lot. Not so good for the Tweeters, especially if it rains. By the time we were at the Cape the rain, driving at times throughout Thursday, had abated to a sprinkle. At the media parking lot we were waved through and found a spot in the front row. Carol Anne objected because she planned to sleep, but then re-thought it and decided front row, closest to the media center, was all good especially if it rained. The car stayed in the front row. The media center, 12:45 am. The media center is deserted with only a skeleton public relations crew. Carol Anne and I walk across the street to the cafeteria taking advantage of a break in the rain. The selection is thin, but we get coffee — something which, inexplicably, the canteen wagon which will show up about 3 am never has. Clearly more sleep and less coffee is in order. I apologize. Carol Anne sleeps and the mission is not scrubbed. 3:20 am, the press site.I drift the press site out to the Tweetup tent looking for Tweeters. No luck. I find three young kids from Canada covering their first shuttle launch. They’re pumped. I love their enthusiasm. We swap stories about Los Angeles where one of them lived. 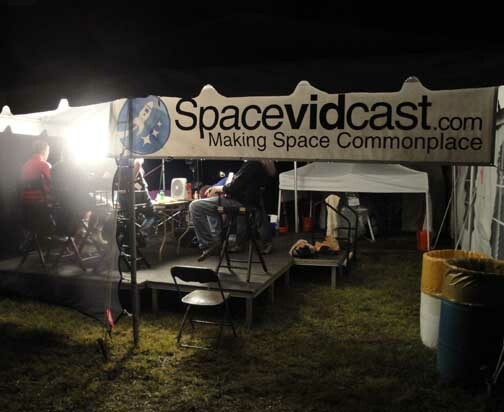 The only action at the Tweetup Tent at 3 am was the Spacevidcast. I think I should know who they are and what they do, but fact is I don't and they were busy broadcasting to godknowswho and taking phone calls. So I waded on through the wet grass and occasional mud, stepping over cables and watching out for nearly invisible ropes. The Tweetup tent is empty but there’s a broadcast going on just outside the front door. I cannot figure out who they are, and no one seems interested in telling me. I drift on. It is dark and muddy out here. Cables snake everywhere. Normally I cut across areas, but now I find there are even ropes tied to nearly invisible posts. Dangerous. I decide for one of the few times in my life to obey the rules. I follow the road and the signs and while it takes longer to get back to the media center, I arrive alive. Androlly. We may be inside the bubble, but son Andrew and his son-to-be wife, Molly,are not going to be. I call them Androlly because they are, in their words, “inside the love bubble” and can be considered, for now, a single entity. However, Carol Anne does not entirely approve. I also have taken to calling our two granddaughters, age 6 and 8, whose last name is “Dagner”, “The Dagnets”. Again, there is not rousing approval. Andrew and Molly earlier had planned to drive overnight from northern Florida where they both work, and then to bunk at our home in Celebration for the weekend. But, of course, the Friday launch is so iffy that an all night drive after working all week long. It is now almost 3:30 am and while they are not exactly missing in action, they are out there somewhere in the dark and we’re not quite sure where. All sorts of memorabilia are for sale in a small wagon that is always parked in the parking lot, but is rarely open. Long before dawn members of the press were lining up. 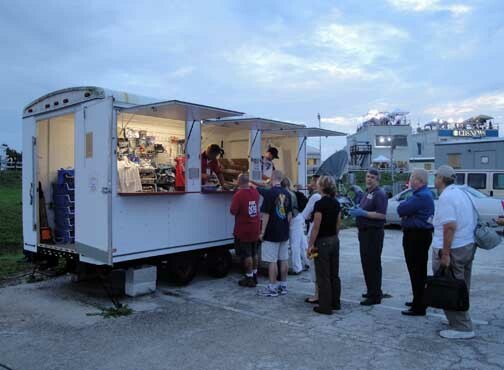 Another shop selling STS-135 merchandise was located adjacent to the cafeteria. Also, companies like Boeing handed out pins, stickers and notebooks at their desk in the media center. Just drift by and ask. Wait — here’s an idea! Maybe someone should just call them. They have stayed in Tallahassee — worked late, read the weather reports and figured it would be a no-go. They’ll be here Sunday if they are right. 4:30 am, Media Press Site. I grow weary of working on revisions in a screenplay, and decide to stretch. In a few moments I am outside gazing at the huge assembly of media trucks in the parking lot and now covering the old site of the Grandstand which was destroyed in a hurricane in 2004. I grow nostalgic realizing that my time at the Cape and at this media site are coming to an end. I have been covering events here since the final Apollo flight, Apollo 17, in December 1972 — before most people covering STS-135 were born. I will be here only once more — for the landing of the Atlantis in a couple of weeks. And then, in all likelihood, my visits to the press site, and indeed the use of the press site itself, are likely to be rare. What really will not happen again is the assemblage of media here this morning. It rivals that first launch I covered, Apollo 17, when 2,200 were accredited. 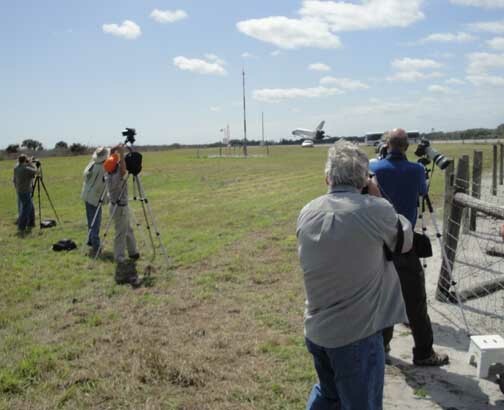 For STS-135 there are probably 3,000, plus another 150 Tweeters. Nothing that NASA has in the pipeline will be-stir media interest like this again for at least a decade — and perhaps, going the way NASA is going, never again. 4:55 am The Annex. I was exiled to the dreaded Annex during STS-134, the previous launch. When too many media request workspace, NASA/KSC has a backup building called The Annex. 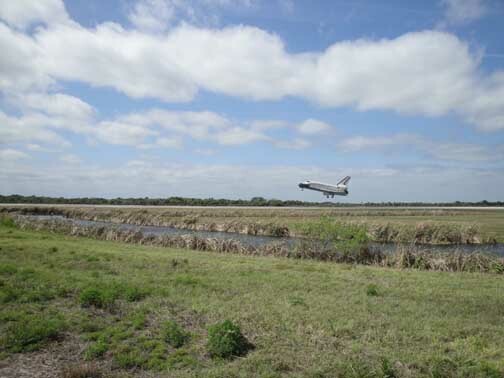 During STS-134 I was exiled to the Annex which has great air conditioning, but feels remote. 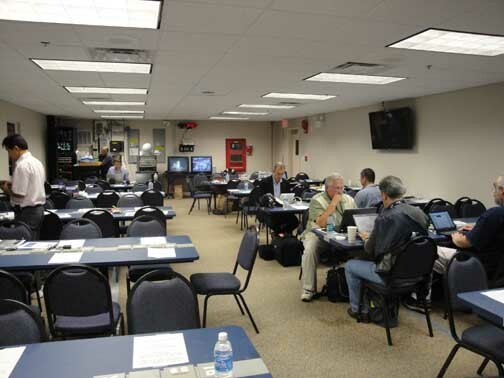 I always have work space in the main media center and until STS-134 I had never heard of “The Annex.” Then arriving to cover STS-134 in April 2011, I found myself in it, facing some nice German guy and sitting beside other well-meaning foreign journalists who spoke no English but smiled a lot. It was not that the Annex was bad workspace — it was actually very good workspace. But reporting from the Annex was like trying to cover the launch from Bulgaria. The main media center is alive, throbbing with activitiy and I could learn things there by eavesdropping, something that I, like most journalists, excel at and take pride in. 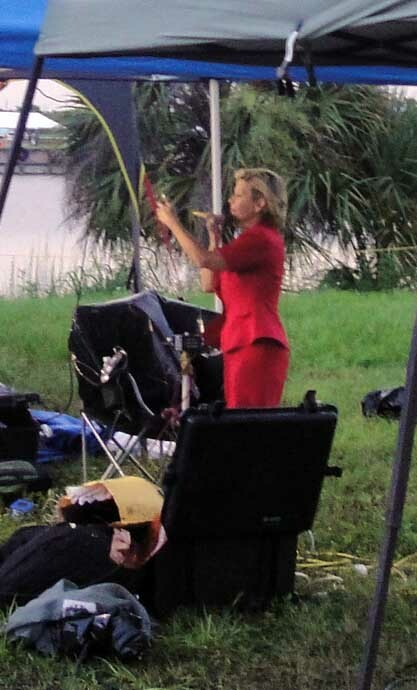 A woman primps before going on the air in one of the many setups for TV lining the edge of the press site. Well. There was no one and nothing to eavesdrop on in the Annex unless you spoke Farci. The best thing about that well-turned out dump was it had great air conditioning. I was curious to see how the Annex was faring during STS-135, and wanted to know who’d managed to get themselves shipped out there — so I stopped by. The Annex was, as expected, rumpled at 5 am with a guy sleeping on four chairs. I drifted around and was stunned to find such organizations as UPI stuck in the back row. The rest was to be expected — the usual gaggle of TV stations from places like Honolulu and foreign media from countries I’d never heard of. 5:10 am The canteen wagon. Buried in the parking I see a glow that doesn’t quite look like other satellite trucks. The canteen wagon was supposed to arrive about 3 pm, but it is usually parked behind the media center, and this morning it is no where to be seen. The Snack Mobile actually had coffeee. it never does. 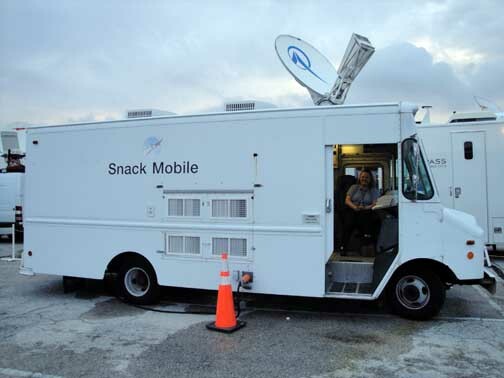 But the Snack Mobile got a new, hard to find spot out in the parking lot instead of just behind the media center. Nonetheless, enough people found it fast enough to drink all the coffee. So, then, the Snack Mobile didn't have coffee. Situation Normal. I decide to investigate since I’m roaming around aimlessly anyway. Lo and behold, it is the canteen, but since they never have coffee I figure I won’t be interested. Entry to the wagon is from the back, exiting past the driver who is the cashier. I lean into the front door and ask if she has coffee. “Really?” They never have coffee. I go inside and find I am standing behind two foreign journalists who are having trouble filling the coffee cups, finding lids, finding the sugar — hell, maybe finding their zippers. Time passes. They continue to dither about one thing and another. They decide to allow me to pass and to get my coffee, so I do. But now they are in front of where the coffee lids are, and they are dithering again. I smile. They smile. The woman running the canteen smiles. Eventually I escape with my coffee which, remarkably, is still hot. 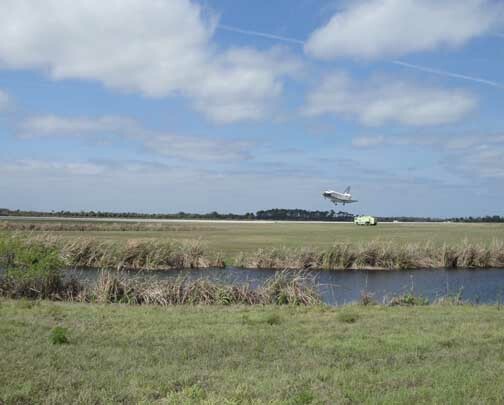 North end of Landing Facility — the Shuttle Discovery is landing from north to south in 22 mph winds directly on nose.